Small amount of worsted weight yarn. I use Hobby Lobby I love this cotton. 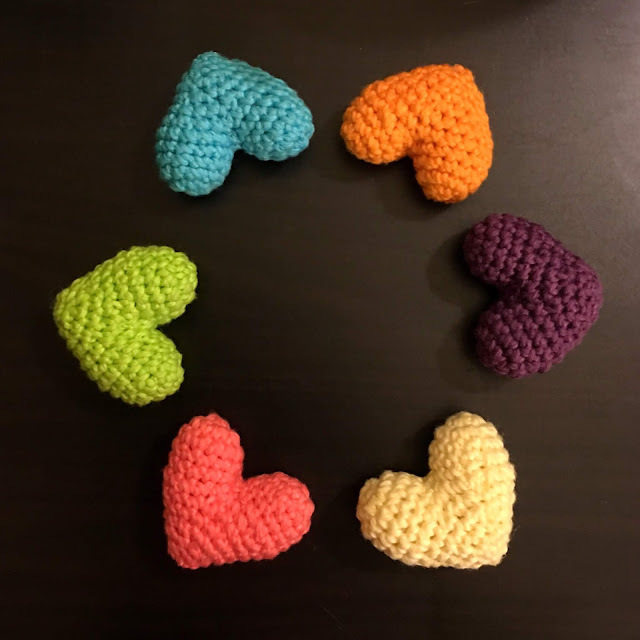 Size: Approximately 2" x 2"
Start with the top domes of the heart (make 2). FO the 1st dome but not the 2nd, instead continue to make the rest of the heart. FO, leaving a long tail for sewing. Whip stitch FLO & pull tight to close the bottom of the heart. Pull the yarn tail up to the top and sew the hole closed between the 2 domes. Weave in end. I hope you have enjoyed this pattern as much as I enjoyed designing it. No unauthorized reproduction or distribution of this pattern or content, in whole or in part, is permitted. You are free to sell any finished items made with this pattern, but please give credit when doing so. A link back to the pattern page is appreciated. Purchase a pdf version of this pattern HERE. 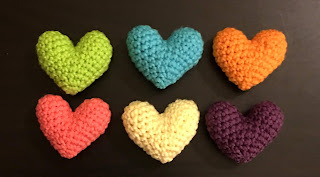 These little guys are so much fun to make and so quick and easy! A great addition to any Easter basket! Size: 2.5” tall, (bunny is 4” with the the ears) when made with suggested yarn and hook size. Make 1 for each – in gray, white or yellow. Embroider eyes at R7 of the body. For the bunny only, embroider a nose at R9 of the body, and add a little smile under the nose. Make 2 – in gray. FO, leaving a long tail for sewing. Pinch the bottom of the ear so that its folded and sew in place. Sew to the head positioned to one side. Make 1 – in white. FO, leaving a long tail for sewing. Stuff & sew to the bottom back of the body. Make 1 – in orange. FO, leaving a long tail for sewing. Sew to the face 1 round under the eyes. Make 2 – in orange. FO, leaving a long tail for sewing. Sew to the bottom of the body. Make 1 – in yellow. FO, leaving a long tail for sewing. Stuff but not too firmly. Sew to the face 1 round under the eyes. FO, leaving a long tail for sewing. Whipstitch FLO & pull tight to close. Sew to the bottom of the body. Add blush to the cheeks of your buddies if desired! 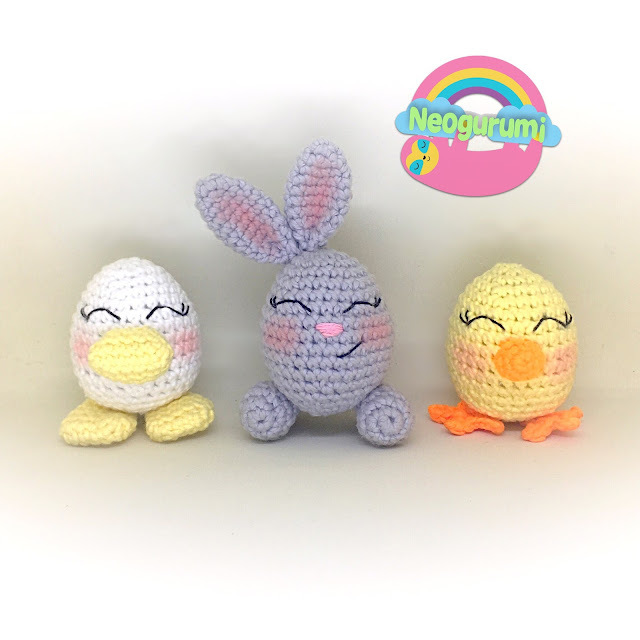 I hope you have enjoyed making your egg buddies as much as I enjoyed designing them. Please feel free to contact me if you need any assistance with this pattern. You are free to sell any finished items made with this pattern, but please give credit when doing so. A link back to the pattern page is appreciated.